In a Lean culture, there is deep respect for the workers. This is manifested by such concepts as “going to gemba” to fix problems where they occur with front line personnel, or having staff write standardized work because they know better what that should look like on the front lines. Make decisions slowly by consensus, thoroughly considering all options; implement decisions rapidly (nemawashi). It is a means to engage staff and eliminate the wastes associated with implementing a plan only to find out at the end there are errors in root cause discovery, problems not identified or disagreements between the different levels of management and workers (stakeholders), thus necessitating “trashing” most, if not all, of the project and starting from the beginning again. If consensus is nurtured along the way, then the only thing to do at the end is implementation. Everyone is already on board. Differences have been worked out along the way. Consensus building permeates all aspects of Lean thinking, from 5 Why to 5S to Standardized Work mentioned above to, especially, kaizen. I blogged earlier about the “True North” statement. This is management's way of defining the future state at the highest levels. The focus areas for the period are then given to the staff through the concept of strategy deployment or hoshin kanri. It is the staff that determines how those focus areas will look like and be implemented in their areas (gembas). But, they are not given carte blanche in these efforts. Dialog is maintained between all levels. It is this back and forth interaction, discussion, input and respect that defines consensus building and hoshin kanri, and is one of the major differences (and advantages!) 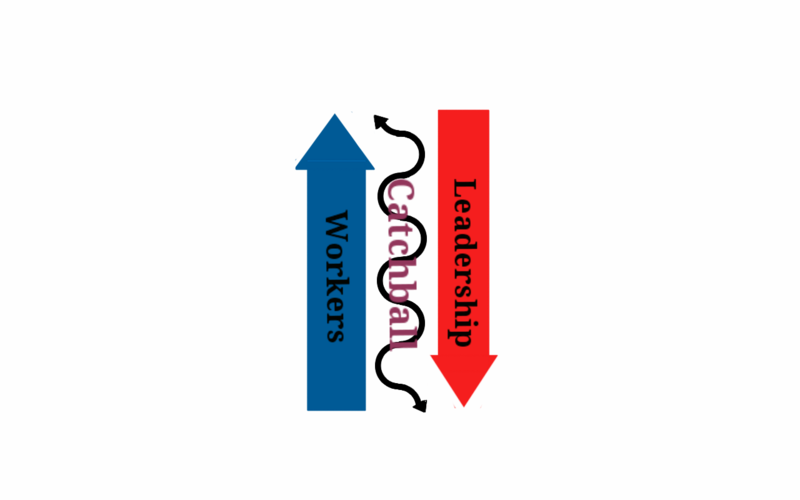 between Lean and traditional Western management. Remember the game we played as children called “catch ball?” Two or more kids would separate themselves by some arbitrary distance and toss a ball back and forth in no particular order. Everyone was included and everyone was equal. Nemawashi or consensus building is the same thing, except that ideas and potential solutions are “tossed around” instead of a ball and the participants are the stakeholders. Everyone is included and everyone is equal in that all opinions are valid and respected. Management has their place and input, but so do the employees. In "corporate speak" it is "bubbling down" and "bubbling up." What kind of management system does your organization utilize? What would be the outcome if your organization utilized consensus building more? How many correct root causes, new ideas or solutions would come out of this concept? How would engagement amongst staff be affected? How would a practice that has adopted this mindset compare and compete versus one that hasn't? Thanks for stopping by. If you enjoy and learn from leanvets.com, please consider sharing this site with your friends and encouraging them to 'follow' it. And, please share your thoughts. We are all part of this 'organization' and, we are all intelligent, valuable and respected!